As a new member of The Ancient Accepted Scottish Rite NMJ, I am always pleased with the events that are going on. This past few weeks the Valley of Chicago is hosting a Masonic film festival which include three films which tie into Freemasonry. The first was The Man Who Would Be King, which I missed but I will end up watching eventually. The second was Murder By Decree. I also couldn't make this one, however I did rent it as to see what it was about and the Masonic influence contained within. I have to say it was a good movie, and the Freemasonry which is portrayed in the movie was neat. Although I liked the movie, overall I felt it portrayed us as a murderous secret society bent on protecting members, no matter the cost. In this film, signs were given, the Tyrians were named and other information was acted out. The third in this series I did make arrangements to attend. The movie National Treasure starring Nicholas Cage was a box office smash. I loved the Masonic influence in it and I am excited to attend, watch and discuss the film. Freemasonry in movies and pop-culture is something that I love. If you remember I had a post some time ago about Freemasonry in comic books, in which I mentioned The League of Extraordinary Gentleman which is laden with symbols and ideas. In my research I had also uncovered that Captain America or as his Brothers know him Steve Rodgers was also a member, as it makes mention of it in one of the books. But returning to films, I researched several movies and scenes which lend themselves to propagating the craft. From the quick scene in Aliens (1986) where a Sergeant is wearing a masonic ring to The Imaginarium of Doctor Parnassus (2009) which is said to be in whole Masonic in nature. The later I cannot confirm or deny as I have not seen it. One thing is for sure, as some people like to listen to Pink Floyd's The Wall and see if it syncs up with The Wizard of OZ, I know Freemasons everywhere keep our watchful eyes out in order to catch these Masonic cameos. As the winter months slowly pass, take some time and watch a movie or two. See what you can find. I'm currently researching real Masonic treasure (supposedly real, anyway). 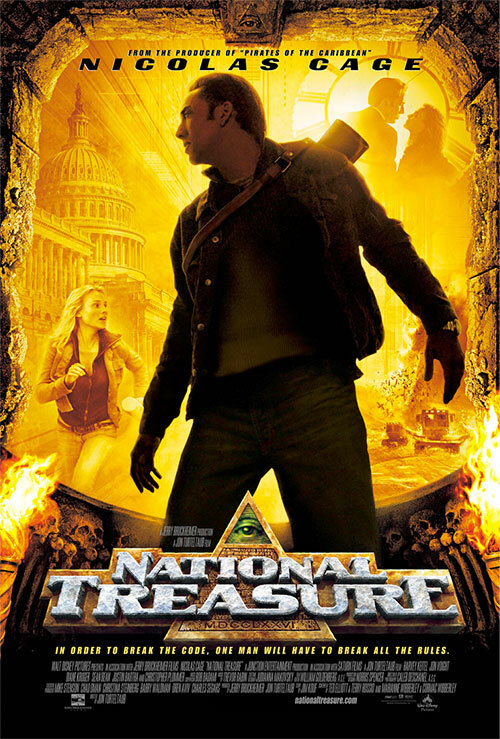 I've seen both "National Treasure" films, but the research has inspired me to watch them again. So I checked them out of the library and this weekend my wife and I will be having a "National Treasure" marathon. I'll look into some of the others you mentioned, too. Thanks. Great article, Brother. 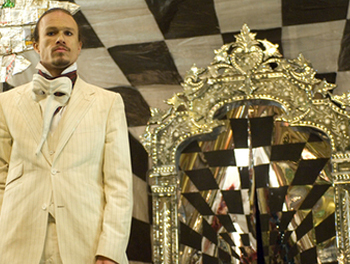 I had not heard of a Masonic connection in Doctor Parnassus; this has reminded me I have yet to watch it! I have also yet to watch the film of The Man Who Would Be King. It has a good cast, though. An interesting example of Freemasonry in popular culture is the Assassin's Creed video game series. The plot revolves around the struggle between two secret societies through history, one which seeks to maintain (and enforce) order in society by any means necessary, and the other which opposes the controlling methods of the former. Both groups show elements of Masonry (primarily in a fantastical version of popular speculation), and one is even the Knights Templar (the originals). The third game is set in Revolutionary America, and features Freemasonry itself in the plot. I haven't played it yet, but from my understanding the Fraternity is portrayed in a largely accurate manner (which is a humorous contrast to the actual secret societies in the story). By the way, it is Dark Side of the Moon which supposedly synchronizes with Oz. Although The Wall would make a much more disturbing contrast!